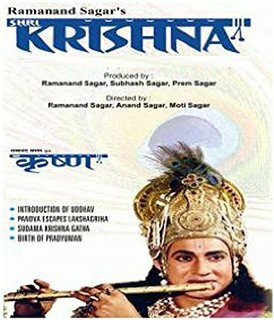 The epic TV serial Shri Krishna sings the glory of Lord Krishna and is based on Shrimad Bhagwat Mahapuran. The life of Shri Krishna is not a simple subject since his life-span is spread across the endless ocean of immortality and eternity. Shri Krishna Bhakti (worship) is embedded in the soul of India since million of years and his image has been nourished by innumerable generations of the common man. The whole world is the manifestation of Lord Krishna. There is nothing in the world expect him. If we follow this and see God in every being, then there will be no stife, no war in the world. There will be only love and devotion.